Meet Henry. He is fighting for his right to go to school. This isn’t about school choice as the school is directly across the street. This is about Henry’s disabilities. He is learning, hearing, and talking impaired due to Autism. But he is obviously a very smart young man, he communicated with his tablet and specialized software. The school system has decided that they are not the right place for his type of disabilities. This is a clear violation of the law. But the Florida school system could care less. The public school systems in this country discriminate against developmentally disabled children all the time. It is a common occurrence, especially since the law in most states is written to make it virtually impossible for the parents to fight back. Each case must be heard individually in a court of law. The school systems have attorneys that they have on retainer. Parents do not. The costs to fight these rulings are sometimes out of reach for the everyday American family. Henry want to go to class and be like other kids, something that is important to most young adults. They want to fill in. While this isn’t something that I think is great thing, but it is an understandable thing. This young man has many impediments in front of him, the last one should be discrimination coming from the very public school system that his parents pay taxes to fund. It may be possible that Henry will not able to do well in this environment. He may need a different approach to his education pursuits. But why isn’t he being given the chance to succeed? Why is Hillsborough County School refusing to even give this boy a chance? I understand the resources are limited in a public school system, but it seem to me that those resources are best utilized on a student who is as eager to learn as Henry as. Give this young man a chance to prove what he is made of. Here is his Facebook page if you care to stand with too. The kid has “special needs” and most every school has a special ed. class (or more), so does this case rate “extra-” special needs ? Everyone is required to pay property taxes and by law a portion of those taxes paid must go to the local school district. IMO, this warrants a special dispensation, a variance of the requirement of this family to pay a portion of their Prop. Tax that would go to their sch. dist. because the school system “refuses” to educate the child and if the child GETS an education, the parents will have to fund it all themselves, at special school(s) or at home. Perhaps some org. would help, but it`s clear the school system is NO HELP at all ! Actually many schools across the country no longer have special needs programs. The new in thing is to “mainstream” the child. In most cases that is effective. Sadly, in others it harms the child. Most state (it could be federal) law says what ever the per pupil cost is, it must be given to the child to attend another school if their local school cannot help them. But I can tell you from experience getting that money isn’t easy. This is why mainstreaming the child is not always a good thing, because it makes it harder on the teacher if they need to give special attention to one child, it takes away from all the other children. But in this case this child really wants to learn. He is obviously very smart, his body just doesn’t cooperate in the same fashion as yours does. But this is just one more thing that needs to change in the public school system. This little boy should be able to go to his local school, if nothing else let him try. Maybe it won’t work, but he should be given the opportunity to try. It might make the teacher do their job ‘better’ but every teacher should be making individual adjustments for every child. and NO it won’t take away form the other children it will enrich the other children. The research shows that ALL students do better in an inclusive setting just as a community does better in an INCLUSIVE society. You have just managed to trot out all the stereotype fear campaigns that seem to have a hold on such a vast majority of society. Mainstreaming is not a fad or a ‘new thing’ it is evolution! When you know better you do better. And rarely ‘mainstreaming’ harms a child – the reality is that people in positions of power and responsibility harm a child (ie teachers/administrators/para educators) either by action or inaction. The local school sent us a letter the summer we were to enroll my son in kindergarten. Neighbors had complained about him to the school, and the letter suggested that perhaps we could “find another situation” for educating our son. He has autism and at age five was a runner and threw anything he could get his hands on. We sent him to a private kindergarten where he circled the classroom and threw paint but happily he only got loose once and was caught immediately. He became friends with a boy who has fragile X and they rolled down the choir stand like puppies during the Thanksgiving pageant. We took him home and home-schooled after he was not passed to first grade. We moved to another school district, he entered school in fourth grade at grade level, we moved to another state for high school where the school was inclusive, and he is now in college. I now work as a resource teacher in the inclusive school and enjoy my students with autism. Our school is somewhat well-funded in comparison to the school that declined to accept my son, and we know how to make the dollars stretch. Our resource classes are relatively large so it is difficult to give any child extra attention. Each family has to make choices as to how best to serve their children and I am happy that we did not force the issue with the original school. If Hillsborough county does not have funding for an aide to accompany Henry during much of his day it might not be safe for Henry. Special Ed is often an unfunded mandate and some schools don’t have resources to secure extra funding. Your son was allowed to try, that is the difference. He has a service dog. He should be allowed to try for one semester. If it doesn’t work for him then his parents can find another way to get him his education. I am glad that your son was able to find a school that worked for him. I just want to see Henry given that same opportunity. HI, I’m Henry’s mom, thank you for writing about this. Henry too was turned away from an elementary school and I helped start an elementary charter school to provide a “welcoming” environment for Henry. Henry is actually a very mellow and smart kid who happens to be non-verbal. He is Autistic, he is hearing impaired, he is physically impaired, he is a joy, he is Henry. We have offered to provide an aide and any services Henry requires because he wants to go to school with his neighbors and be challenged academically. He deserves the same chance that every other person has. 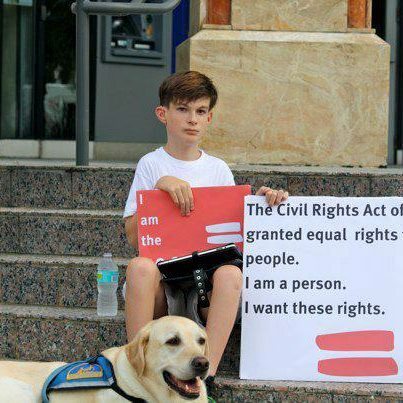 We support and applaud his advocating for this rights.We have always provided an education for Henry and will continue to do so, but discrimination and segregation based on disability labels is wrong. It needs to stop now. Henry has gone into this knowing that things may not change for him, but he wants to do what’s right for everyone. I think it’s ridiculous while ungrateful neurotypicals are allowed to go to public schools,where they will slack off in class and waste all their time talking, that a student who wants to learn can’t go to school. The reason we’re falling behind other countries in regards to education, is our schools have become a daycare for over social blabbermouth neurotypicals. If we made less accommodations for neurotypical’s “special needs” like social time, or a place to go and chat about nothing, we would have the money to support the mentally disabled students who WANT to learn. People say those with Autism are unintelligent, we’re not the ones gossiping during class time, distracting the class with shenanigans, or being bullies. We’re the ones who deserve an education, not Neurotypicals who could care less about getting one!